You know that I almost never make pictures that have people in them, but sometimes things are just too tempting to resist. I missed the best part though, which was when the man with the dog took cell-phone photos of the older gentleman. There was just something about it that was so dear that I had to look away. 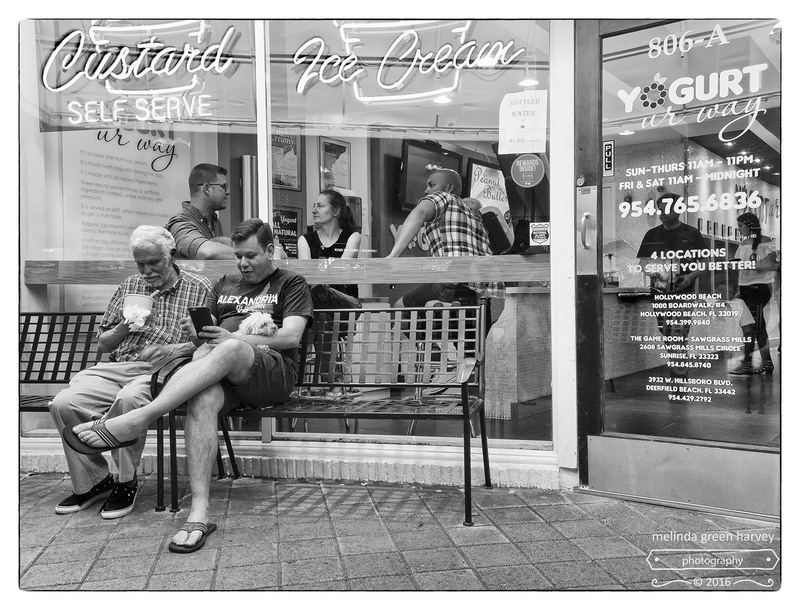 Posted on July 10, 2016, in Photography and tagged 365 photo project, black and white photography, downtown, florida, Fort Lauderdale, Las Olas Boulevard, melinda green harvey, monochrome, NIK Silver Efex Pro 2, one day one image, photo a day, photography, postaday, street photography. Bookmark the permalink. 4 Comments. He seems pleased with a shot. He is! And the older gentleman is quite pleased with his ice cream. Everyone was happy! The pooch and the photographer and her audience are happy as well ! I love all the clutter in this one, as organized by you.